DraftSite.com's mock drafts now go beyond the internet. 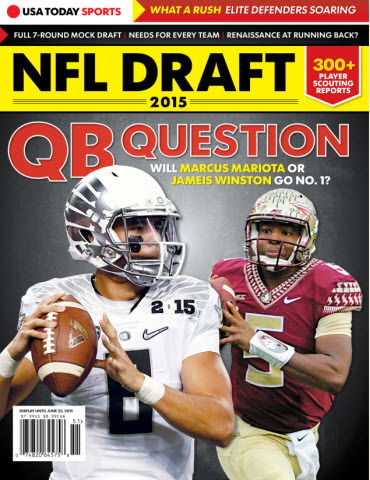 For the 5th straight year, DraftSite has now been published in USA Today's Annual Draft Preview Magazine! DJ Boyer and Jared Belson present the 2015 7-Round Mock Draft spanning 8 pages starting on page 20, followed by a 2-Round 2016 NFL Mock Draft by DJ Boyer on the back page! Think it's too early for a 2016 preview? Think again. Last year in 2014, DJ and Jared predicted Jameis Winston at #1, Leonard Williams at #2, and Marcus Mariota at #3. So buy the magazine online here or at your local newsstands, take a look at our 2015 and compare it to our daily mock draft, and check out who we have for 2016, because we did pretty well a year ahead last year!